I started this blog two months ago, and I've really only just begun. I've got a ton of topics jotted down for 2012, and I'm excited to share those with you in the coming months. In the meantime, here are the Top 5 blog posts for 2011, based on views and retweets. 2011 has been a great year, but I'm excited to see what 2012 holds. Happy New Year! 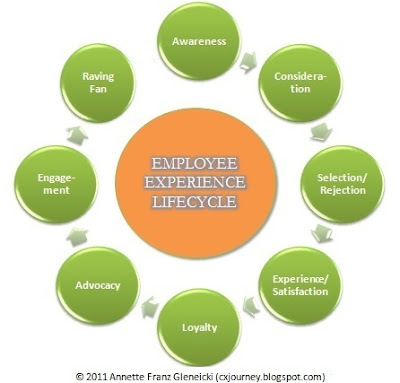 In my post about Engaging Employees, I pointed out that one of the things to consider as part of that step in your VOC initiative is the employee experience lifecycle - from Need through Exit. Plotting the employee experience lifecycle will guide you in a variety of different ways, not the least of which is in helping to determine what types of surveys you might conduct and, more importantly, what types of metrics to track. Remember that this is the employee experience lifecycle,so it's diagrammed from the employee's point of view. In this post, I'll describe the various stages of the lifecycle, as depicted in the image below. You'll notice that the employee experience lifecycle has stages similar to those in the customer experience lifecycle I wrote about previously. I'll explore these more as I define them below, but to some degree, the employee's lifecycle with the company is similar to a customer's, odd as that sounds. As with the customer experience lifecycle, the employee experience lifecycle begins with a Need: the need for a job. If the employee has previously worked for the company, Need becomes the first step even as a rehire. Need is not in the lifecycle graphic above, as sometimes it comes before Awareness and sometimes after. From the employee's perspective, here's how the lifecycle stages are defined. Awareness: This is when prospective employees first become aware of your brand; this might or might not be as a result of the Need for a job. This Awareness might be created by your marketing or advertising efforts, job postings, or word of mouth/referrals from a friend, recruiter, or employee. Consideration: Now that prospective employees are aware of your brand, it becomes one of the brands in their consideration set for employment. This means that they'll research and investigate your company to find out if you are a worthy employer. Interviewing with the company also falls into this stage. Selection/Rejection: Once the interview process is completed, the employee is either selected or rejected; it could also be a case in which the employee selects or rejects the company. Note that this might be the end of the employee experience lifecycle for some, and yet that end may only be temporary, as the candidate might choose to seek employment with the company again in the future or vice versa. This is also a good time to note that the lifecycle is not necessarily linear and potentially has twists and turns to it. Experience: During this stage, the employee becomes a part of the family: they go through orientation and training, do their jobs, have performance reviews, are offered career development opportunities, etc. And ideally, if they are satisfied with the experience because their basic employment needs and expectations have been met, they move into the next stage. Loyalty: During this stage, employees are happy with their employment, and, as a result, make a conscious decision to remain an employee rather than look elsewhere for a new job opportunity. Advocacy: If employees reach this point, they are committed to the organization, respect leadership and the vision, and enjoy being a part of the company so much that they want their friends to become a part, as well. They open up to their networks and refer friends to work for the company. Engagement: Employees have achieved that emotional bond with the company in this stage. They enjoy the culture and their work, and their friends work there with them. They take pride in what they do and feel ownership in the company. They feel the company does great things, including the things that aren't necessarily tied to revenue, i.e., community involvement, corporate/social responsibility, etc. Raving Fans: And finally, I believe that the ultimate employee experience yields Raving Fans. They are passionate about the company, the people, the products, what the company does, and why the company does it. These employees feel they are part of something bigger, align with the company's core values, and feel part of a community striving to do something great (purpose-driven); they show an outward expression of their devotion to the company. They become brand ambassadors. If you offer these employees the choice of cash to leave versus staying to be a part of something cool, they choose to be cool. The last part of the employee experience lifecycle is Exit. I don't show it in the graphic because it might not happen at the end of the continuum - it could happen sooner. Also, if they Exit, they could be rehired at some point in the future. I'll write more about the employee experience in future blog posts. 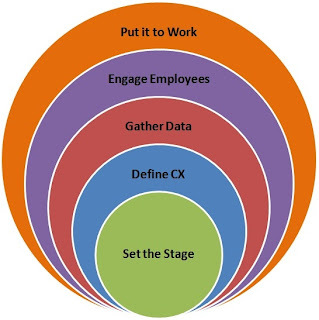 This is the fourth post in a five-part series about the key components of a CX framework. The fourth component of the CX framework is the employee. Employees cannot be forgotten, as they are a crucial part of the success of your CX transformation and this new customer-centric culture! Remember that the employee experience drives the customer experience; if your employees aren't engaged, it will be very difficult for them to delight your customers; in very simple terms, this describes "the spillover effect." I've been talking about this concept (not with that specific label) since my days at J.D. Power and Associates 20 years ago, and yet, in the heat of VOC/CX design, employees are forgotten: "Oh, we'll collect feedback from employees later. We'll incorporate employee data later. Let's start with customers." No more; that is just not acceptable. Without your employees, you have no customer experience. Bruce Temkin recently wrote about findings from his latest research in which he took a look at the linkage between CX and employee engagement. It's real, and they matter! There are a few different ways to look at ensuring employees are a part of the overall customer-centric culture. I will devote a future blog post to defining the employee lifecycle, but it is important to understand it before you consider what types of surveys you might conduct among your employees and what types of metrics you will want to measure and track. Employee feedback needs to be both solicited (e.g., lifecycle or ad hoc surveys) and unsolicited (e.g., a "suggestion box" or other mechanism for employees to provide feedback). Employees need to feel comfortable that the feedback they provide is anonymous and confidential - and that it comes with no consequences other than corrective actions by the organization to fix the wrongs and praise to recognize the rights. Outside of these more formal mechanisms, a truly open-door policy for discussions about issues, suggestions, etc. is certainly a great policy. Not only should it be a policy, it needs to be a reality. A lot of organizations talk about this, but it's never really embraced as such. And if it is embraced, it often ends with some sort of retribution for the opinions provided. Gathering the right feedback from employees will help to ensure that they have the training, tools, and resources to do their jobs and do them effectively. Having an HR steering committee in place to take ownership of the feedback and the employee experience will ensure that no ideas are ignored and all feedback is acted upon in a relevant way. A closed-loop process is as much a part of a VOE as it is for VOC. Communication is key. Employees need to know that their feedback is valued - and used. This culture is not only about collecting and using employee feedback but also about the people themselves! Regarding hiring practices, you need to make sure to hire the right people for this customer-focused culture. Hire nice people, hire for attitude. Skills can be taught - nice cannot! Hire people with service backgrounds, especially those who have worked for companies best known for their service cultures. (That may not always be possible but great to strive for.) 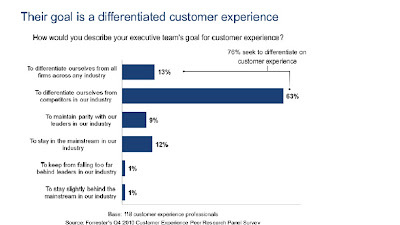 And, once hired, every person in every role must have an understanding of his/her impact on the customer experience. In addition to hiring, you'll need a solid employee onboarding process to showcase the customer-focused culture of the organization; it will open new employees' eyes to what that means and the freedom they are afforded, which is a good segue into the next topic. Employee ownership means that employees are involved in decisions about how to improve the customer experience - and the company culture is such that this is allowed, supported, and applauded. And employees must understand their roles and their impact on the customer experience in order to deliver great experiences and increase loyalty. I'll spend more time on employee ownership in a future blog, but the important takeaway here is that the culture must be there and not a barrier to allowing this to happen. And, last but not least, rewards and recognition for a job well done must be a part of your culture. Praise for delighting customers should always be given. Showing a little love goes a long way toward facilitating and nurturing employee engagement. The final post in the series is coming soon! This is the third post in a five-part series about the key components of a CX framework. Jimmy Neutron: Well, the data seem to support this hypothesis. Sheen: Never... argue... with... the data. And there you have it. You now know everything you need to know about data! OK. All kidding aside, this is the critical part of the CX framework. The Voice. The Gather Data stage is, oftentimes, where companies stumble. Because this stage is about more than just surveys; it's about any and all data that pertains to the customer and the customer experience. This is also where the multi-channel experience gets tripped up because of disparate systems that make sharing of the customer data across the various channels impossible. So let's look at some of the sources of customer data. Keep in mind that, as I mentioned before, "customer" data also includes VOP, VOM, and VOB. Just as critical to include is VOE. Structured, solicited feedback: This typically comes in the form of a survey. I would strongly advise that you create a customer feedback map at this point to identify the various places within the organization that you are collecting such feedback from your customers. Time for a concerted effort! Unstructured, unsolicited feedback: Unstructured feedback is open-ended comments in a survey, while unsolicited feedback is also usually unstructured, coming from social media, blogs, and online forums and communities. Competitive data: This data takes the form of competitive benchmark surveys or secondary market research. It can be unstructured or structured. Non-survey customer data/metrics: Operational and financial data such as FCR, call handling, abandon rate, profitability, revenue, etc. is what I'm referring to here. CRM data: While #4 refers to company operational data, i.e., data from the company perspective, CRM data refers to the data from the customer perspective, so to speak. Purchase frequency, profitability, last purchase data, products purchased, last service call, etc. are examples of CRM data. Compiling all of this data into one place is a real challenge. I'm not sure that anyone has mastered this. But in order to deliver a successful multichannel/omnichannel experience, all of it needs to be present and accounted for... analyzed with insights clearly spelled out... and easily accessible to your front-line employees in a format that allows them to deliver an exceptional experience for your customers. Without pushing relevant data and insights to employees - and a culture that supports data as a tool to deliver the best experience - talking about it is useless. And speaking of employees, they're up next in Part 4 of the series. In a previous post, I mentioned that you need to outline the customer experience lifecycle - from Need through Departure - in order to understand the relationship stages or phases that customers have with your brand. 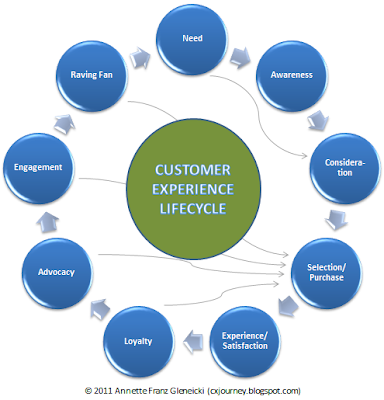 (Note: this is the customer experience lifecycle, i.e., from the customer's point of view.) In this post, I'll describe the various stages in the lifecycle. The image below depicts the lifecycle, minus the start and end point, which I'll refer to as Need and Departure and define below, as well. Here's how the rest of the stages of the lifecycle are defined, from the customer's perspective. Note that this lifecycle is not necessarily linear and could potentially circle back on itself. That's an important consideration to keep in mind. Awareness: This is when customers first become aware of your brand, which might happen as a result of your marketing or advertising efforts or word of mouth/referrals from a friend. Consideration: Now that they are aware of your brand, it becomes one of the brands in their consideration set. This means that they'll research and investigate your products and services, along with those of your competitors. Selection/Purchase: Once customers have done their homework, they are ready to select and purchase your products or services. Experience: During this stage, customers learn how to use and consume your products or services, training, support, etc. Ultimately, if they are satisfied with the experience because you've met their basic needs and expectations, it leads to the next stage. Loyalty: During this part of the the lifecycle, customers feel comfortable with the brand experience, and, as a result, continue to use your products and services and will even broaden their purchases to other products or services that they haven't used in the past. Advocacy: If your customers reach this point, you're starting to get into exciting territory. This is when customers become an extension of your sales force and recommend your products and services to their friends and colleagues. They've had nothing but exceptional experiences to this point. Note that a lot of customer experience lifecycle definitions stop here. I'm going to add two more. Engagement: While you've reached a pretty solid stage in the relationship when your customers hit Advocacy, Engagement brings in that emotional bond. Now we're talking Love and Trust. They can't live without your products or services. Raving Fans: And finally, I believe that the ultimate customer experience yields Raving Fans. These customers have gone beyond Engagement, beyond that emotional bond. Is that possible? Yes! Consider those brands where customers feel they are part of something bigger, where they show an outward expression of their devotion to the brand: they tattoo their bodies with the brand logo or even name their children after the brand!! You know the examples: Apple, Zappos, and Harley Davidson are just a few! OK, after all that happy talk, I do still have to bring up the the very last part of the customer experience lifecycle: Departure. Obviously, this is the one stage of the lifecycle that companies hope customers never achieve, but, as you know, it happens. Departure can take many forms: churn, cancel, die. (But know that, short of death, it really doesn't have to end here; a customer who has left or has stopped using your products or services may consider you again in the future!) You can't control the latter, but the former two are in your hands. How will you ensure that your customers never reach that stage? This is the second post in a five-part series about the key components of a CX framework. Earlier this week, I began a series on the "Key Components of a CX Framework" with a graphic of the components and a description of the first step, Set the Stage. Today I'll continue the series with a summary of the next step, Define CX. This step involves outlining the customer experience from a variety of angles. This is an extremely important step in the process (not that the others aren't), and you'll want to spend some time on these items to ensure you've done a thorough job. Remember that different types of customers will have different experiences with your company; and you'll want to devote different types of effort and resources for different customer segments. Remember that, while you're considering the following items from the company perspective, you'll want to keep the customer and the customer's perspective front and center. 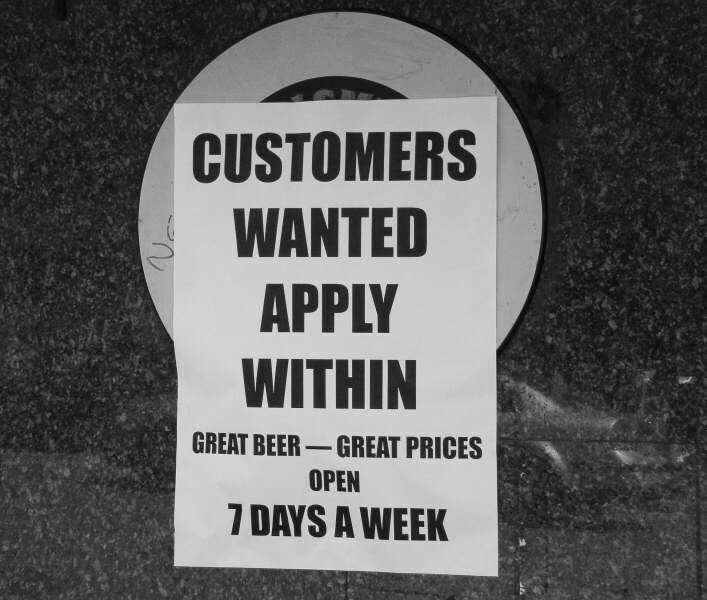 Define your customer: Who are your customers? Why do they buy products and services from you? What are their needs? What problems are they trying to solve? What are their personas? Identify your customer segments: Are they new, returning, tenured, inactive, canceled? Have they bought certain types of products or a variety of products? Are there important psychographic segments to consider? What is their annual $$ spend? Are they profitable for you or not? Are they key/strategic, mid-market, smaller, self-service, etc.? Outline the customer experience lifecycle: What are the stages of the customer's relationship with your brand, from Awareness through Departure? Create a customer journey map: Refer to my previous post on this topic for more details on what that entails, but in short, you want to identify each of your customer touchpoints and understand both the customer-facing interactions and the behind-the-scenes efforts for each touchpoint along the CX journey. Each of these items will guide you as you consider the next component of the CX framework, Gather Data. Note: as part of your VOC/CX initiative, you should consider partners, franchises, etc. as customers, as well, and go through the same exercise for them. Any solid VOC initiative will also include VOP (partner), VOM (market), VOB (business), and VOE (employee) inputs. I'll consider these more as I write about the next step. This is the first post in a five-part series about the key components of a CX framework. Over the last 20 years, I've helped design many, many VOC (Voice of the Customer) and CX (Customer Experience) initiatives for my clients. As such, I came up with the following graphic that shows the key components required for a successful go at it. Honestly, it's not just an "initiative;" it's a cultural transformation. Throughout this series, I'll define each component; as I move through the series, I may come back and update previous posts. I'd like to call out that when I say "Voice of the Customer," I'm not simply referring to a survey. There are so many other sources for the customer voice than a survey, and any VOC initiative involves so much more than just the feedback itself. It doesn't just have one person overseeing the effort; it takes a village, er, an entire company. VOC is an important piece to the overall effort of an organization to be more customer-focused. It is one of the tools to help you deliver the optimal customer experience. There is no end point; focusing on VOC and the CX are ongoing -- remember, this is a journey. As I define each of the items in the graphic below, keep in mind that the customer will always be at the center of every conversation, decision, or plan that is a part of the transformation. Does your CEO support the VOC/CX efforts? Has an executive sponsor or lead been determined? If you don't have executive buy-in or support, how will you get it? What quick wins can you create to show the impact of a VOC/CX focus? Is there a CX champion at the C-level, someone who owns the initiative? 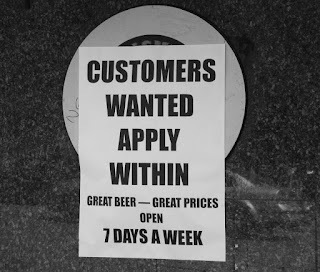 Perhaps you have a Chief Customer Officer? Will the customer have a seat at every executive management and board meeting? What's the organization's current level of maturity when it comes to customer-centricity? Do you have clearly-defined objectives for your VOC/CX efforts? What are your key success metrics? What is your communication plan? How will you communicate your efforts to employees, customers, partners, stakeholders, etc.? This is also a good time to start thinking about the tools, data, and people you'll need to engage in order to make the initiative successful. 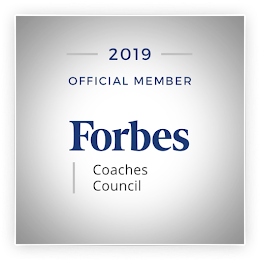 Success comes in the form of aligning the right culture, the right tools, the right people, the right processes, and the right data - all at the right time. In my next post, I'll explain what I mean by the next step, "Define CX." This blog was originally published by me on 10/18/2010 at http://blog.allegiance.com/2010/11/customer-feedback-map-charting-sources-of-voc-data/. On the heels of my recent paper, Customer Data: The Essential Element of Your Enterprise Voice of the Customer Program, here is an exercise that you can use to identify all of the sources of customer data in your organization, specifically, the sources of customer feedback data. Every department in your company thirsts for feedback from customers to help measure brand awareness, design products, improve service offerings, understand satisfaction levels, and more. Unfortunately, more often than not, there is no concerted effort across the organization to ensure that (a) customers are not over-surveyed – which can be defined either as being surveyed too frequently, i.e., no touch rules, or asked the same or similar questions by different departments – or (b) the feedback is collected, analyzed, and used in a cohesive fashion. In a previous blog post, I talked about creating a CX Journey Map. Think about the many customer touchpoints of your organization, and then think about the various departments in your organization that might be asking customers for feedback at each of those touchpoints. It can be quite overwhelming — for you and for your customers! To make sense of it all, you should compile a Customer Feedback Map to accompany your CX Journey Map. Creating a Customer Feedback Map can be a daunting task, especially in very large, disparate, and/or siloed organizations, but the benefits – not the least of which is financial – are endless. For example, if you have nine different departments all working in a vacuum, including licensing nine different survey, EFM, or text analytics platforms, consolidating the data can reduce costs and improve the way the company listens to the voice of the customer. Other benefits include reducing/eliminating respondent fatigue, increasing response rates, and improving the actionability of the data. The next step is to consolidate. Centralizing to one department both the ownership of your VOC efforts and the platform used to collect, analyze, and respond to the feedback eliminates redundancies, creates efficiencies, saves money, and ensures a cohesive approach to your VOC initiative overall and, ultimately, to the customer experience. Identifying the various sources of customer feedback within your organization is a valuable exercise. You may just discover some very scary information: how much your customers are being asked to provide feedback – and just how little of that is actually being used in a meaningful way. Have you built a culture of trust within your organization? What does that entail? 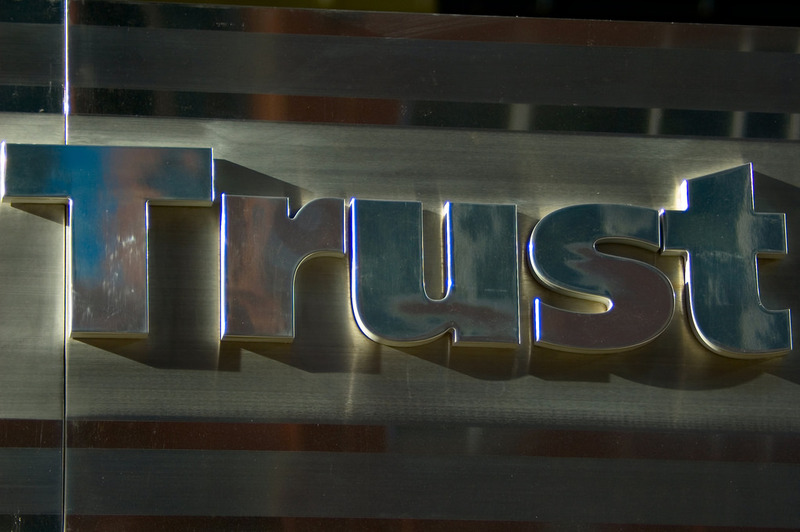 Trust is an important part of the customer experience equation. It is such a powerful quality to have and to hold. A company must trust its employees. Employees must trust their employers. Companies must (empower employees to) trust customers. One company that is built on trust is Zane's Cycles. This story is shared over and over again, but it's a great example of how trust is key to a great customer experience and, hence, a successful business venture. Chris Zane allows people to test drive his bikes (for 30 days, no less!) without requiring a driver's license or some other form of collateral, and his average loss is only five bikes per year (with 4,000 sold per year). So the reason I chose to write about trust this week doesn't have anything to do with buying a bike. No, it actually comes from a very unexpected source that pleasantly surprised me: McDonald's. Earlier this week, I had taken my boys to Taekwondo. The weekly routine after the Tuesday night class is to pick up McDonald's for them. I pulled into the drive-thru, ordered their items, and drove to the window to pay for the order. I reached into my purse and realized I didn't have my wallet with me (because I had switched purses at the last minute before we left the house). In the moment I realized this, a variety of thoughts ran through my head, not the least of which was two famished boys in the backseat anxiously awaiting their dinner and the chaos that would ensue if I didn't hand them some food in the next two minutes. I asked the cashier if I could just give her my credit card number, since I have it memorized. She went to get the manager, who informed me that they could only enter the card numbers with a swipe of the card. And then, wait for it... she surprised me! She said that if I promised to return to pay for the order, I could take it without paying now. WOW! I promised I would and off we went. Thirty minutes later, with two boys with full tummies, I returned to pay for the order. 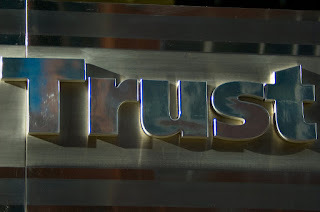 It's been said that trust can be defined as "need intersecting with belief." I thought this was an interesting way to look at it. And I understand it now. I’ve stumbled upon several items this week that called out to me to write about the importance of being different, standing out from the crowd, and not being a “me-too” when it comes to your CX Journey. 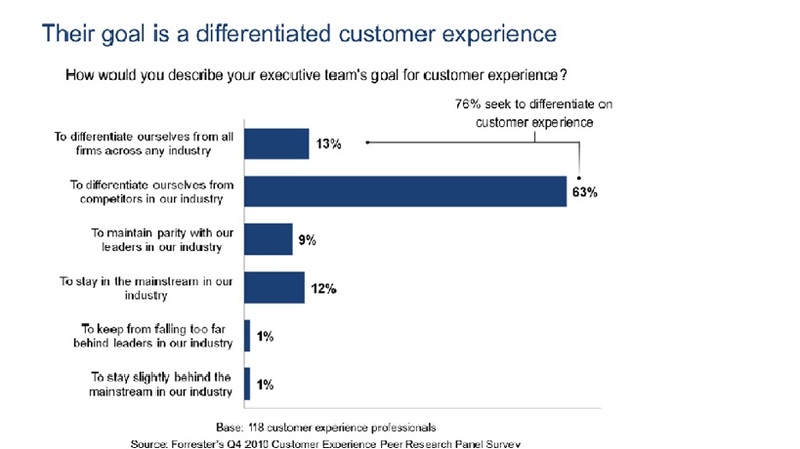 Customer experience statistics continue to be dismal, which really leaves the door wide open for more companies to rise above it all and delight customers in their own unique ways. When will that happen?! Here are just two examples of #cx statistics I read this week that make me cringe. 86% of customers stop doing business with a company because of bad experiences (Harris Interactive, Customer Experience Impact Report). <-- How many companies create bad experiences? @Vivisimo tweeted this week that “61% say #CX has NOT improved over past year, 14% say it declined. There's nothing remarkable in that. "I hate benchmarking. Benchmarking is stupid. Why is it stupid? Because we pick the current industry leader, and then we launch a five-year program, the goal of which is to be as good as whoever was best five years ago five years from now. Which to me is not exactly an Olympian aspiration." My experience with benchmarking has been that companies want to do it because “that’s what everybody does.” I think they really just want to know where they stand, to keep score. The problem I see is that benchmarking is the least of their worries because so many companies have to fix the basics before they can even dream of being, or offering experiences, like Apple or Zappos. If you want to benchmark to keep score, great, call a spade a spade. If you want to benchmark so you can figure out how you can stand out from the rest of the crowd, awesome. I’ll post a blog next week on benchmarking. Tom Peters includes this quote from Seth Godin in his presentation, as well. "You cannot be remarkable by following someone else who's remarkable." Someone else already did the thing that’s remarkable… now you’re just being a copycat. If you’re going to benchmark against another company, take what they’ve done and do it better, add your own twist of remarkable, make it unique to your company in a remarkable way. Or just go do something completely different, that’s unique and remarkable on its own. Stand out from the crowd. Customers appreciate that and will share it with their friends! Wow, doesn’t that ring true. If you’re doing remarkable things, then you don’t need to advertise. Your brand speaks for itself. Or your customers speak for you. Or everyone in the industry talks about you. How many people are sick of hearing about @Zappos during the #custserv chats?! Go and do great things! 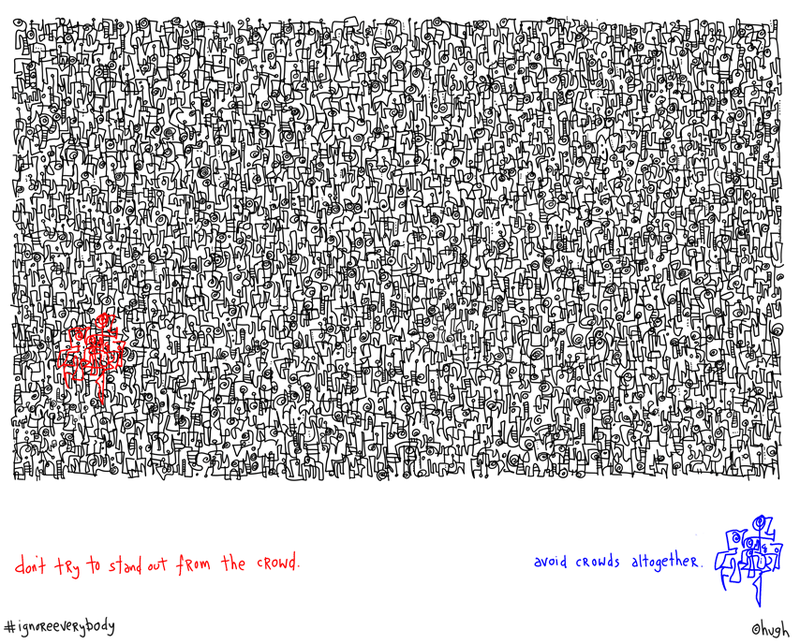 The next day, there was this picture in an email from gapingvoid gallery in my inbox. 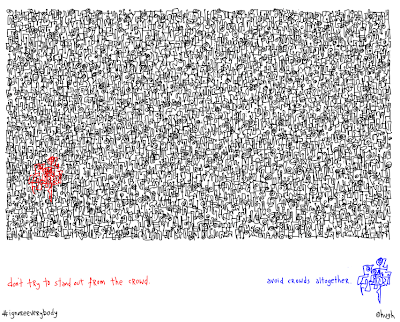 If you can’t read what it says at the bottom of the image, there are two quotes: “Don’t try to stand out from the crowd” and “Avoid the crowd.” Be the guy in blue --> do something different. Be remarkable in your own way. Step away from the crowd. And finally, that afternoon, I was watching a recorded webinar by Andrew McInnes (@apmcinnes), and the chart below was on one of his slides. And while it’s encouraging that three-fourths of companies want to have a differentiated customer experience, I appreciate the honesty of the 23% who want to stay where they are or keep from falling behind even further. What are you doing to ensure that your customers have a remarkable experience?